Scrotal abscess (see image below) is an abscess that can be either superficial or intrascrotal. The etiology of superficial scrotal abscess is infected hair follicles and infections of scrotal lacerations or minor scrotal surgeries. 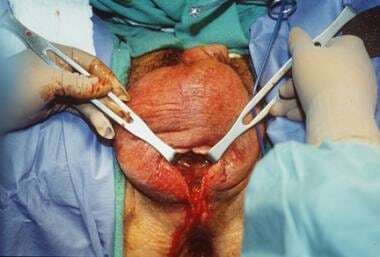 An intrascrotal abscess most commonly arises from bacterial epididymitis, but may also be related to tuberculous infection of the epididymis, a testicular abscess that ruptures through the tunica albuginea, or drainage of appendicitis into scrotum through a patent processus vaginalis. Scrotal abscesses can also occur as a result of extravasation of infected urine from the urethra in patients with a urethral stricture and neurogenic bladder using an external collection device. Fournier gangrene (necrotizing fasciitis) is a gangrenous process that involves the external genitalia. It often arises from an infection involving the urinary tract or from direct extension from a perirectal source. See image below. The management of an intrascrotal abscess, regardless of the cause, requires surgical drainage (see image below). The abscess cavities must be opened and drained, including the testis if it is involved. The cavity should be left open and packed. Fournier gangrene (necrotizing fasciitis) requires prompt resuscitation and surgical exploration and debridement as well as aggressive antibiotics. Superficial abscesses also require incision and drainage but may be treated in the emergency room/at the bedside depending on the size of the abscess. The patient depicted in this image is a man with alcoholism and known cirrhosis who presented with exquisite pain limited to the scrotum. 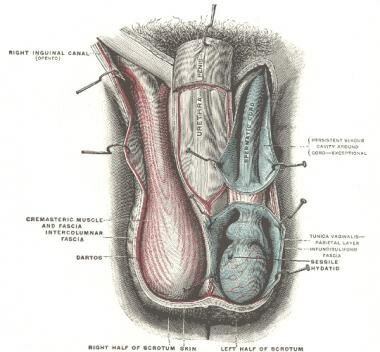 The scrotum has been opened along the median raphe, which liberated foul-smelling brown purulence and exposed necrotic tissue throughout the mid scrotum. The testicles were not involved. Courtesy of Thomas A. Santora, MD. No contraindications to the drainage of an intrascrotal abscess exist, outside of the patient being too ill to withstand surgery. Patients with Fournier gangrene (necrotizing fasciitis) require aggressive resuscitation and institution of broad-spectrum antibiotics at the time of identification and prompt surgical intervention. The incision and drainage of a superficial scrotal abscess can often be performed by infiltrating the area with an anesthetic and intravenous narcotic use. The surgical treatment of an intrascrotal abscess often requires general or spinal anesthesia. Patients with suspected Fournier gangrene (necrotizing fasciitis) are often explored under general anesthesia given the severity of the illness and the potential extent of the disease. These patients require aggressive resuscitation and institution of broad-spectrum antibiotics that cover both aerobic and anaerobic organisms. The instrumentation needed for the treatment of an intrascrotal abscess is that commonly used for any surgical exploration. The wound cavity should be left open and packed. In those individuals in whom Fournier gangrene (necrotizing fasciitis) is suspect, a more extensive set-up is needed due to the potential for widespread involvement of the disease. A cystoscope should be available to rule out urethral pathology as the source of the infection as well as instrumentation for sigmoidoscopy/anoscopy to rule out a anorectal source of the disease. In most cases, the patient positioning is in a supine position with the scrotum shaved and the genitalia prepped and draped. If Fournier gangrene (necrotizing fasciitis) is suspected, then a lithotomy position is more useful because it allows access to the lower abdominal wall, the genitalia, and the perianal region. Injury to intrascrotal contents may occur with exploration. 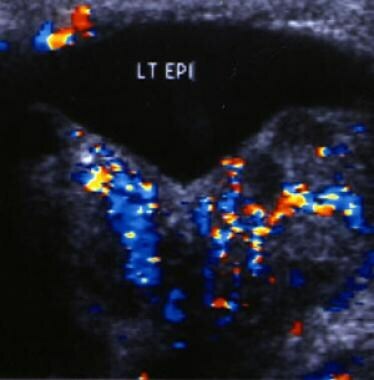 In addition, severe epididymitis may lead to necrosis of the epididymis and loss of function and extension to the testis may lead to a testicular abscess and necrosis. The scrotum is a continuation of the abdominal wall. The layers include the scrotal skin, the dartos layer (a continuation of Colles fascia), the external spermatic fascia (a continuation of the external oblique aponeurosis), the cremasteric muscle and fascia (a continuation of the internal oblique muscle), the internal spermatic fascia (a continuation of the transversalis fascia), and the tunica vaginalis. The scrotal contents consist of the testis, epididymis, and the spermatic cord structures. Thus, the location of the abscess, superficial versus intrascrotal, dictates the extent of the exploration. See images below. Cross-section illustration of a testicle and epididymis. A: Caput or head of the epididymis. B: Corpus or body of the epididymis. C: Cauda or tail of the epididymis. D: Vas deferens. E: Testicle. Illustration by David Schumick, BS, CMI. Reprinted with the permission of the Cleveland Clinic Center for Medical Art and Photography © 2009. All Rights Reserved. Superficial scrotal abscesses, those confined to the scrotal wall, can often be treated by infiltrating the skin around the abscess and then incising over the abscess with a knife until the cavity is opened and drained. The cavity is then packed to keep it open and drained. The incision and drainage of an intrascrotal abscess is typically performed under general anesthesia. The skin, overlying the area of fluctuance/mass, is incised with a knife. The subcutaneous tissue (fascial planes) are dissected with electrocautery until the tunica vaginal is encountered. The tunica vaginalis is lifted from the underlying testis and epididymis and incised. Devitalized tissue, including the epididymis and/or testis, is debrided. The scrotal wound is left open and packed to prevent reoccurrence of the abscess. After the initial surgical exploration, the scrotal wound packing is changed on a regular basis to prevent accumulation of purulent material and to debride devitalized tissue. Keeping the wound open allows it to granulate from the base, preventing a closed space from forming that may become secondarily infected. Postoperative antibiotic therapy should be tailored to urine culture and wound culture sensitivities and should be continued until the infection is resolved. Incomplete drainage or debridement of devitalized tissue may lead to persistence/extension of the abscess. Failure to identify the source of the infection, such as an underlying urethral stricture, may lead to recurrence. Fournier gangrene (necrotizing fasciitis) may lead to significant tissue loss requiring subsequent skin grafting for scrotal, abdominal and perineal skin loss. Individuals may require placement of a suprapubic tube for urinary diversion as well as a diverting colostomy. Despite aggressive resuscitation, broad-spectrum antibiotics, and aggressive surgical intervention, the mortality rate with Fournier gangrene remains high. Patients should be followed until full healing has occurred. No devices are associated with this surgery. Scrotal ultrasound (see images below) is a useful adjunct to the history and physical examination in the assessment of a scrotal abscess. It allows for localization of the scrotal abscess as well as an evaluation of the vascularity of the epididymis and testis, which may be involved. 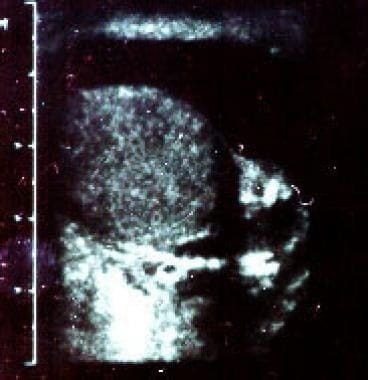 Scrotal sonogram showing the testes adjacent to the inflamed epididymis with a reactive hydrocele. The initial antibiotic therapy for a scrotal abscess is broad-spectrum until the urine and wound culture results and sensitivities are available. Patients with Fournier gangrene are treated with antibiotic regimens that cover both aerobic and anaerobic organisms. In the setting of an epididymitis-associated scrotal abscess, the responsible organism often varies with the age and sexual activity of the male. 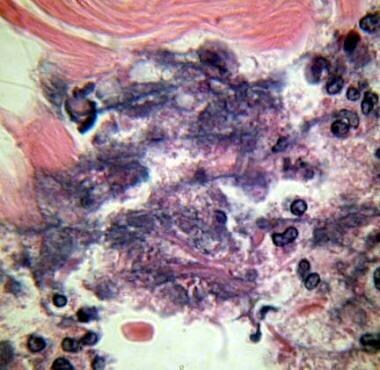 In sexually active men, the predominant organisms are Chlamydia trachomatis and neisseria gonorrhea, with chlamydia being more common. In homosexual men younger than 35 year of age, coliform bacteria are more common. In older males who are typically less sexually active, urinary tract pathogens are the most common organisms, with Escherichia coli and pseudomonas being more common; however, sexually transmitted pathogens should also be considered. Less common causes of epididymitis that can lead to abscess formation include candidal epididymitis in immunocompromised patients (AIDS) and epididymitis secondary to tuberculosis. In boys, epididymitis can also be secondary to a postinfectious inflammatory reaction to pathogens such as enterovirus and adenovirus. Thakur A, Buchmiller T, Hiyama D, Shaw A, Atkinson J. Scrotal abscess following appendectomy. Pediatr Surg Int. 2001 Sep. 17(7):569-71. [Medline]. Bodner D. Resnick MI, Novick AC. Scrotal abscess. In: Urology Secrets, eds. 3rd. Hanley and Belfus Inc; 2003. 70, pg 270. Corman JM, Moody JA, Aronson WJ. Fournier's gangrene in a modern surgical setting: improved survival with aggressive management. BJU Int. 1999 Jul. 84(1):85-8. [Medline]. Okwudili OA. Temporary Relocation of the Testes in Anteromedial Thigh Pouches Facilitates Delayed Primary Scrotal Wound Closure in Fournier Gangrene With Extensive Loss of Scrotal Skin-Experience With 12 Cases. Ann Plast Surg. 2015 Mar 17. [Medline]. Kashanian JA, Mazur DJ, Hehemann MC, Morrison CD, Oberlin DT, Raup VT, et al. Scrotal Ultrasound for Pain: Low Frequency of Absolute Surgical Indications. Urology. 2017 Oct. 108:17-21. [Medline].